I love the flavor of fennel, both in seed form and as whole fresh fennel bulb, so I just recently bought some of this springtime favorite at the grocery store. I’ve also started experimenting with eating the stalks and fronds (that many recipes would have you discard or save for soup stock), so I put together a dinner that used the whole thing. 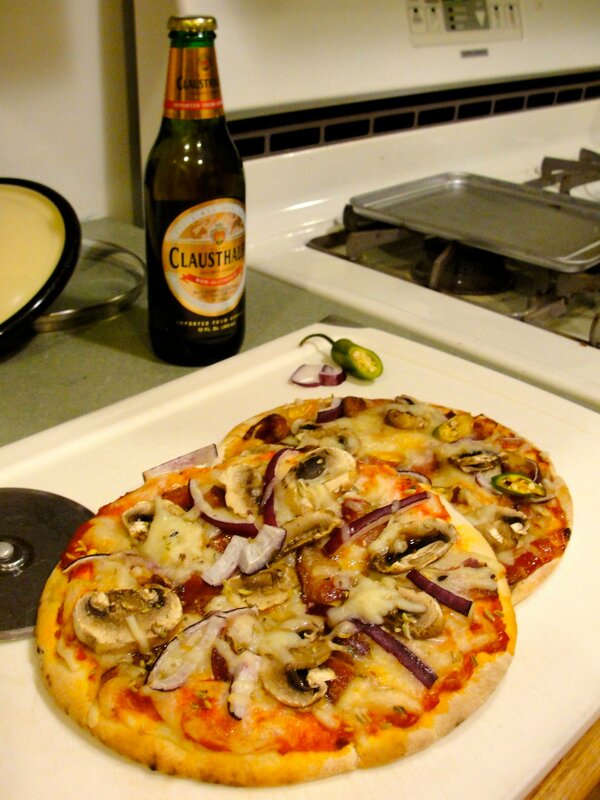 It seemed fennel and whitefish would go quite nicely together, and I found a couple recipes online (linked below) that I used as a guide. I’ve been using pangasius lately (from frozen), for the same reason everyone else is, it’s inexpensive, farm-raised, and tasty. 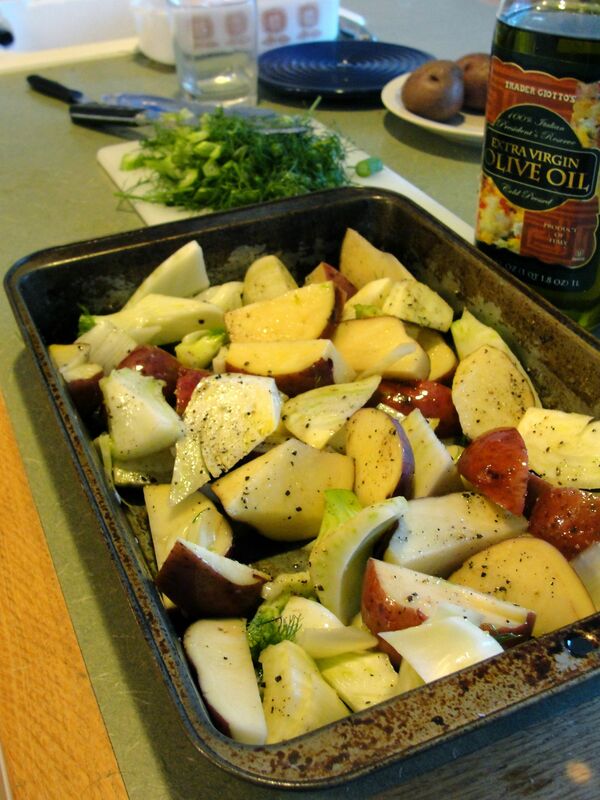 First, I roughly cut fennel bulb and red potatoes. I also chopped the fennel stalks and fronds, but left them aside, since they don’t need so much time in the oven. I coated a baking pan with olive oil, and tossed the potato and fennel, salt and peppered them, to prepare them for a 425° F oven. Roast the vegetables (uncovered), for perhaps 40 minutes, initially; every 10-15 minutes, toss them so they cook and brown evenly. 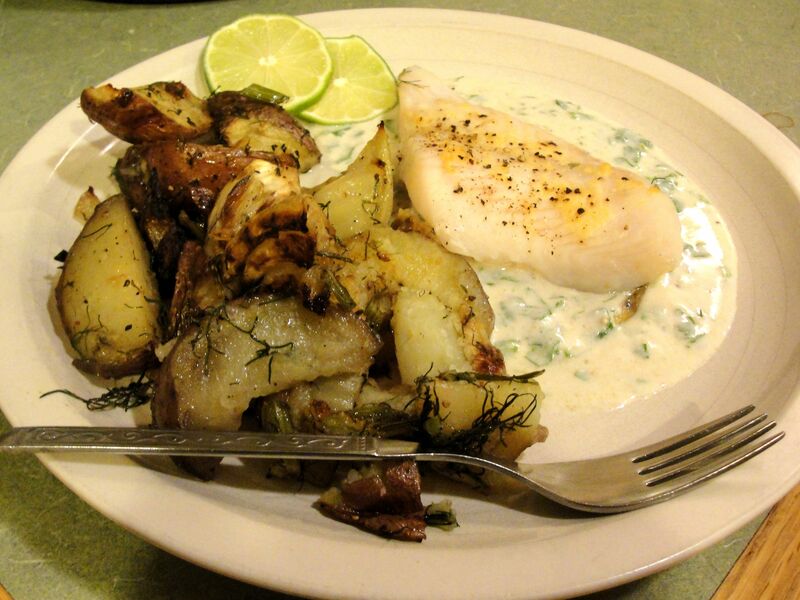 While roasting, prepare a yogurt sauce to accompany the fish. I made a sauce from homemade yogurt, chopped cilantro, cumin powder, lime juice, salt, pepper, and a dash of cayenne powder. When the potatoes are somewhat tender, mix in the chopped fennel stalks and fronds, and continue cooking for perhaps 15 minutes. When the potatoes are pretty much done, it’s time to add the fish. 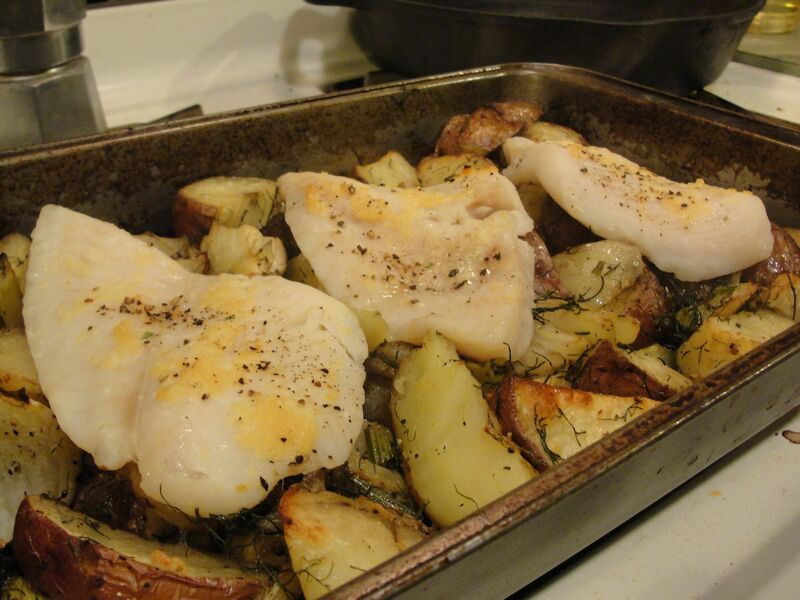 Since it’s easy to bake fish in a hot oven as well, I decided to make this a one-pan meal, placing the pangasius fillets atop the partially-roasted vegetables for a final 15-20 minutes of baking. I spread some mashed garlic on the fillets and seasoned them simply with salt and pepper before placing in the oven. 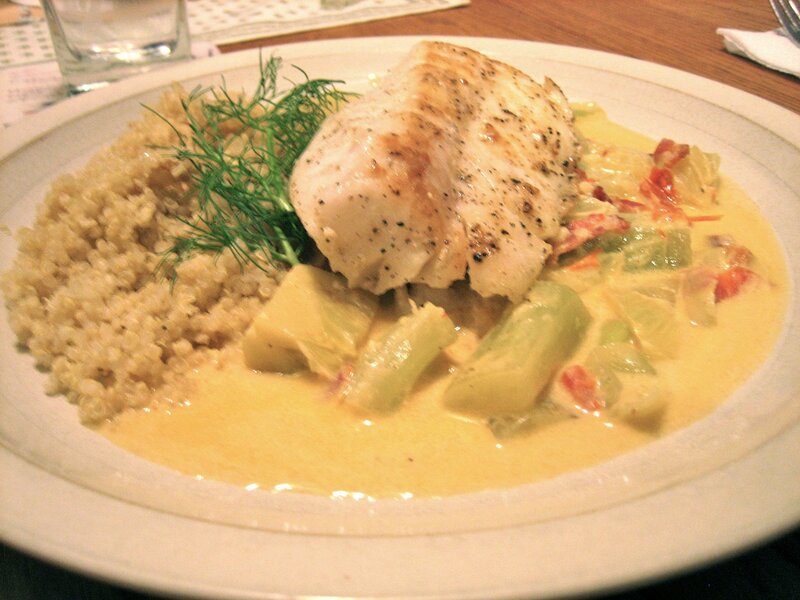 The dish is done when the fish is cooked through and just be flaked slightly with a fork, but not dry. 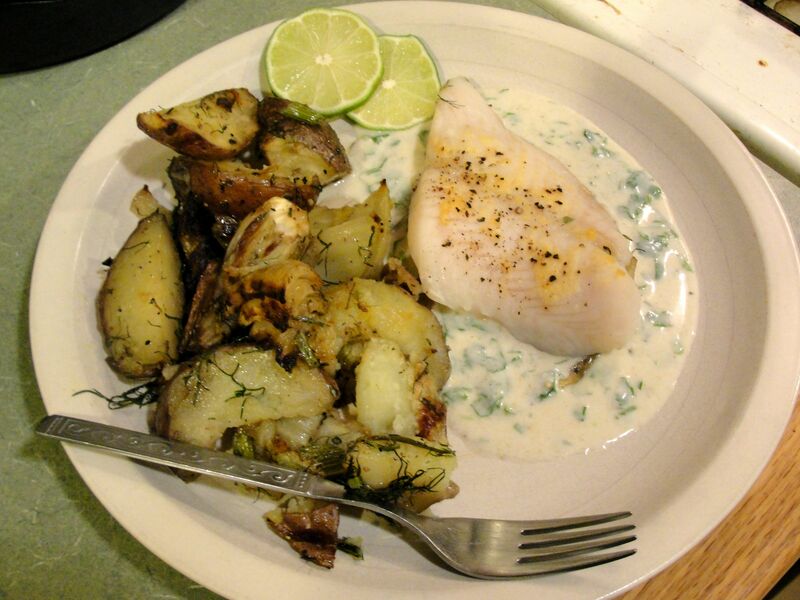 I served a single fillet atop the yogurt sauce, with the fennel and potatoes on the side, and some lime slices; wedges would have been more convenient for squeezing on the fish. I’m not a big fan of just eggs for breakfast – one is usually enough for me, and must be accompanied by more interesting textures. But, of course, eggs are inexpensive and nutritious, so I decided to try a frittata again. I had some fennel stalks around, and was curious to try them (since I love the flavor), after having used the milder fennel bulb for fennel au gratin at Christmastime and not wanting to merely discard the green stalks. 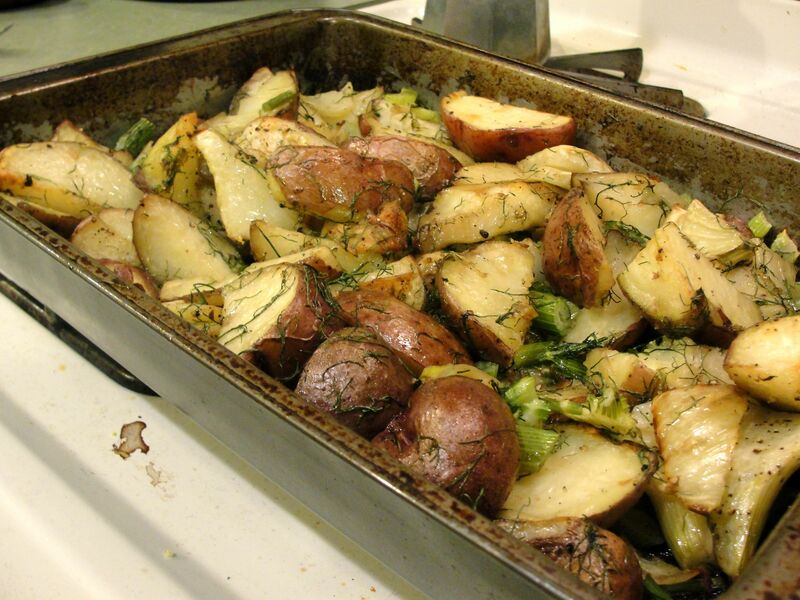 In an oven safe skillet, over medium low heat, sauté potato and fennel with salt and pepper until potato is somewhat tender. Add white portion of scallions and mushrooms, and lighly sauté. Stir pesto into vegetables and immediately pour egg mixture into skillet evenly over sautéed ingredients. Cook for a few minutes, until egg mixture begins to set and top with tomatoes, shredded cheese, and scallion greens. 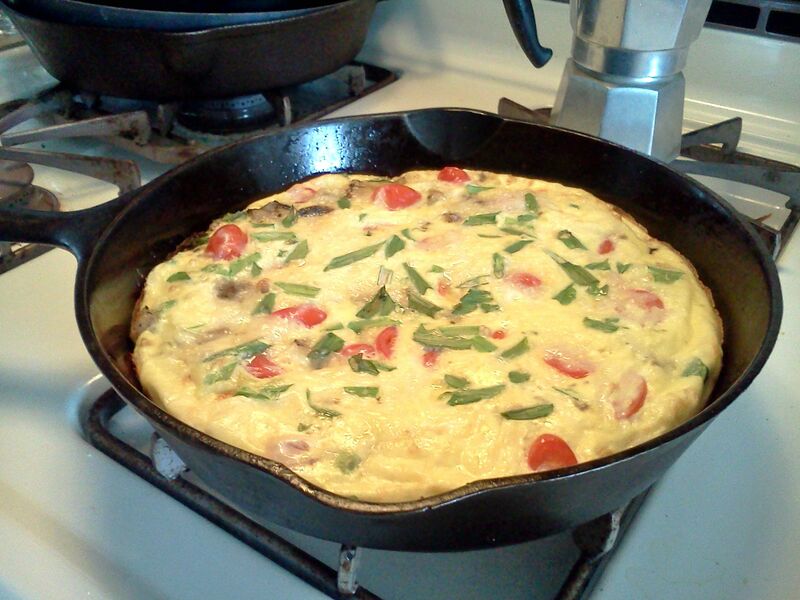 Place skillet in oven for 7-15 minutes, until egg appears firm on top and is cooked through. 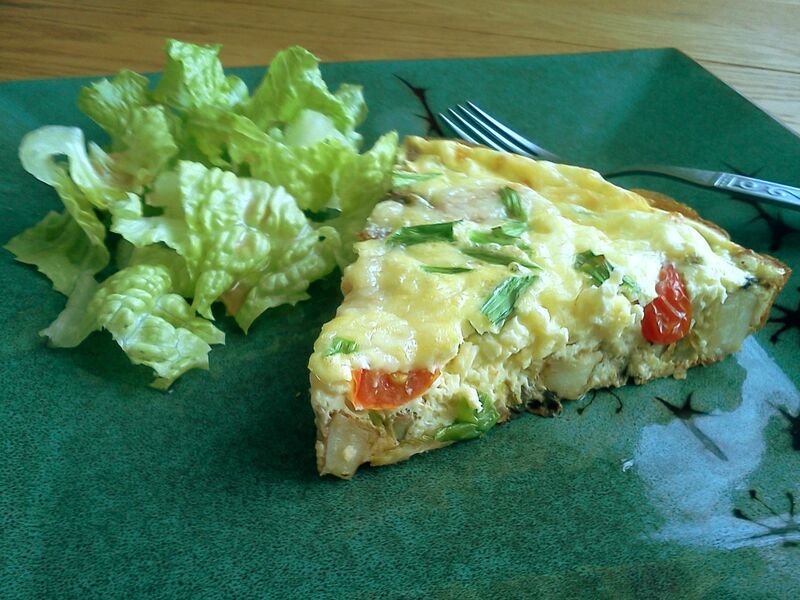 I served frittata wedges with chopped romaine lettuce and a dressing of simply olive oil and red wine vinegar. This one came out nicely, and the bit of fennel stalk worked nicely to flavor the potatoes. When you have thyme but not much time, try this simple pasta dish with two of my favorite flavors. If you don’t like anise (a licorice-like flavor), omit the liquor. Prepare farfalle or any pasta. 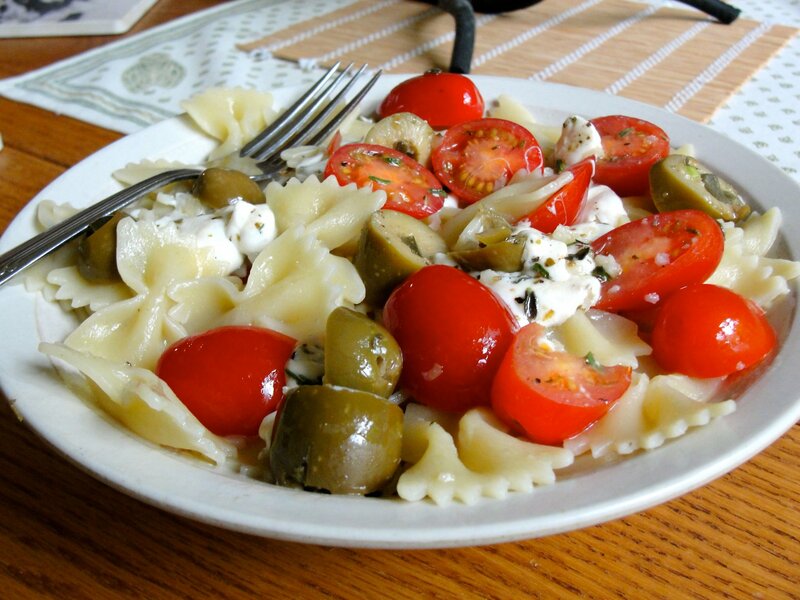 When pasta has just a few minutes left, lightly saute sliced sweet plum tomatoes and sliced green olives in a couple tablespoons of olive oil, with fresh garlic, fresh thyme, oregano, and black pepper. Add a splash (i.e., just a fraction of a teaspoon) of an anise-flavored liquor such as Pastis (French, that I had on hand), Ouzo (Greek), or Sambuca (Italian). When the pasta is done, add diced fresh mozzarella to saute so that it just begins to melt and the garlic and herbs cling to it. Drain pasta and serve topped with the oil and sauteed ingredients. Tips: You can get everything at Trader Joes (currently), and if you use their Dijon mustard, that happens to be very sharp, I think it’s a bit better for this recipe than, say, Grey Poupon Country Dijon, a staple I always have in my kitchen. Quinoa can be easily prepared in a rice cooker.